Sphingolipids are a class of lipids containing a backbone of sphingoid bases, a set of aliphatic amino alcohols that includes sphingosine. They were discovered in brain extracts in the 1870s and were named after the mythological sphinx because of their enigmatic nature. These compounds play important roles in signal transduction and cell recognition. Sphingolipidoses, or disorders of sphingolipid metabolism, have particular impact on neural tissue. A sphingolipid with an R group consisting of a hydrogen atom only is a ceramide. Other common R groups include phosphocholine, yielding a sphingomyelin, and various sugar monomers or dimers, yielding cerebrosides and globosides, respectively. Cerebrosides and globosides are collectively known as glycosphingolipids. 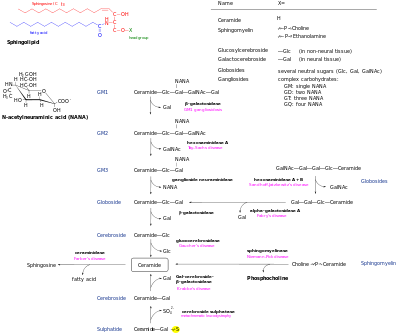 Metabolic pathways of various forms of sphingolipids. Sphingolipidoses are labeled at corresponding stages that are deficient. In experimental animals, feeding sphingolipids inhibits colon carcinogenesis, reduces LDL cholesterol and elevates HDL cholesterol. Because of the incredible complexity of mammalian systems, yeast are often used as a model organism for working out new pathways. These single-celled organisms are often more genetically tractable than mammalian cells, and strain libraries are available to supply strains harboring almost any non-lethal open reading frame single deletion. The two most commonly used yeasts are Saccharomyces cerevisiae and Schizosaccharomyces pombe, although research is also done in the pathogenic yeast Candida albicans. There are several disorders of sphingolipid metabolism, known as sphingolipidoses. The main members of this group are Niemann-Pick disease, Fabry disease, Krabbe disease, Gaucher disease, Tay–Sachs disease and Metachromatic leukodystrophy. They are generally inherited in an autosomal recessive fashion, but notably Fabry disease is X-linked. Taken together, sphingolipidoses have an incidence of approximately 1 in 10,000, but substantially more in certain populations such as Ashkenazi Jews. Enzyme replacement therapy is available to treat mainly Fabry disease and Gaucher disease, and people with these types of sphingolipidoses may live well into adulthood. The other types are generally fatal by age 1 to 5 years for infantile forms, but progression may be mild for juvenile- or adult-onset forms. Sphingolipids have also been implicated with the frataxin protein (Fxn), the deficiency of which is associated with Friedreich's ataxia (FRDA). Loss of Fxn in the nervous system in mice also activates an iron/sphingolipid/PDK1/Mef2 pathway, indicating that the mechanism is evolutionarily conserved. Furthermore, sphingolipid levels and PDK1 activity are also increased in hearts of FRDA patients, suggesting that a similar pathway is affected in FRDA. Other research has demonstrated that iron accumulation in the nervous systems of flies enhances the synthesis of sphingolipids, which in turn activates 3-phosphoinositide dependent protein kinase-1 (Pdk1) and myocyte enhancer factor-2 (Mef2) to trigger neurodegeneration of adult photoreceptors. ^ Chun J, Hartung HP (2010). "Mechanism of action of oral fingolimod (FTY720) in multiple sclerosis". Clinical Neuropharmacology. 33 (2): 91–101. doi:10.1097/wnf.0b013e3181cbf825. PMC 2859693. PMID 20061941. ^ Dickson RC (1998). "Sphingolipid functions in Saccharomyces cerevisiae: comparison to mammals". Annual Review of Biochemistry. 67: 27–48. doi:10.1146/annurev.biochem.67.1.27. PMID 9759481. ^ Dickson RC (May 2008). "Thematic review series: sphingolipids. New insights into sphingolipid metabolism and function in budding yeast". Journal of Lipid Research. 49 (5): 909–21. doi:10.1194/jlr.R800003-JLR200. PMC 2311445. PMID 18296751. ^ Bartke N, Hannun YA (April 2009). "Bioactive sphingolipids: metabolism and function". Journal of Lipid Research. 50 Suppl: S91–6. doi:10.1194/jlr.R800080-JLR200. PMC 2674734. PMID 19017611. ^ Merrill AH (December 1983). "Characterization of serine palmitoyltransferase activity in Chinese hamster ovary cells". Biochimica et Biophysica Acta. 754 (3): 284–91. doi:10.1016/0005-2760(83)90144-3. PMID 6652105. ^ Merrill AH, Williams RD (February 1984). "Utilization of different fatty acyl-CoA thioesters by serine palmitoyltransferase from rat brain". Journal of Lipid Research. 25 (2): 185–8. PMID 6707526. ^ Zitomer NC, Mitchell T, Voss KA, Bondy GS, Pruett ST, Garnier-Amblard EC, Liebeskind LS, Park H, Wang E, Sullards MC, Merrill AH, Riley RT (February 2009). "Ceramide synthase inhibition by fumonisin B1 causes accumulation of 1-deoxysphinganine: a novel category of bioactive 1-deoxysphingoid bases and 1-deoxydihydroceramides biosynthesized by mammalian cell lines and animals". The Journal of Biological Chemistry. 284 (8): 4786–95. doi:10.1074/jbc.M808798200. PMC 2643501. PMID 19095642. ^ Pruett ST, Bushnev A, Hagedorn K, Adiga M, Haynes CA, Sullards MC, Liotta DC, Merrill AH (August 2008). "Biodiversity of sphingoid bases ("sphingosines") and related amino alcohols". Journal of Lipid Research. 49 (8): 1621–39. doi:10.1194/jlr.R800012-JLR200. PMC 2444003. PMID 18499644. ^ Pewzner-Jung Y, Ben-Dor S, Futerman AH (September 2006). "When do Lasses (longevity assurance genes) become CerS (ceramide synthases)? : Insights into the regulation of ceramide synthesis". The Journal of Biological Chemistry. 281 (35): 25001–5. doi:10.1074/jbc.R600010200. PMID 16793762. ^ Causeret C, Geeraert L, Van der Hoeven G, Mannaerts GP, Van Veldhoven PP (October 2000). "Further characterization of rat dihydroceramide desaturase: tissue distribution, subcellular localization, and substrate specificity". Lipids. 35 (10): 1117–25. doi:10.1007/s11745-000-0627-6. PMID 11104018. ^ Hannun YA, Obeid LM (February 2008). "Principles of bioactive lipid signalling: lessons from sphingolipids". Nature Reviews Molecular Cell Biology. 9 (2): 139–50. doi:10.1038/nrm2329. PMID 18216770. ^ Bandhuvula P, Saba JD (May 2007). "Sphingosine-1-phosphate lyase in immunity and cancer: silencing the siren". Trends in Molecular Medicine. 13 (5): 210–7. doi:10.1016/j.molmed.2007.03.005. PMID 17416206. ^ Hannun YA, Obeid LM (July 2002). "The Ceramide-centric universe of lipid-mediated cell regulation: stress encounters of the lipid kind". The Journal of Biological Chemistry. 277 (29): 25847–50. doi:10.1074/jbc.R200008200. PMID 12011103. ^ Spiegel S, Milstien S (July 2002). "Sphingosine 1-phosphate, a key cell signaling molecule". The Journal of Biological Chemistry. 277 (29): 25851–4. doi:10.1074/jbc.R200007200. PMID 12011102. ^ Lavieu G, Scarlatti F, Sala G, Carpentier S, Levade T, Ghidoni R, Botti J, Codogno P (March 2006). "Regulation of autophagy by sphingosine kinase 1 and its role in cell survival during nutrient starvation". The Journal of Biological Chemistry. 281 (13): 8518–27. doi:10.1074/jbc.M506182200. PMID 16415355. ^ Venable ME, Lee JY, Smyth MJ, Bielawska A, Obeid LM (December 1995). "Role of ceramide in cellular senescence". The Journal of Biological Chemistry. 270 (51): 30701–8. doi:10.1074/jbc.270.51.30701. PMID 8530509. ^ Hetz CA, Hunn M, Rojas P, Torres V, Leyton L, Quest AF (December 2002). "Caspase-dependent initiation of apoptosis and necrosis by the Fas receptor in lymphoid cells: onset of necrosis is associated with delayed ceramide increase". Journal of Cell Science. 115 (Pt 23): 4671–83. doi:10.1242/jcs.00153. PMID 12415011. ^ Snider AJ, Orr Gandy KA, Obeid LM (June 2010). "Sphingosine kinase: Role in regulation of bioactive sphingolipid mediators in inflammation". Biochimie. 92 (6): 707–15. doi:10.1016/j.biochi.2010.02.008. PMC 2878898. PMID 20156522. ^ Brown DA, London E (June 2000). "Structure and function of sphingolipid- and cholesterol-rich membrane rafts". The Journal of Biological Chemistry. 275 (23): 17221–4. doi:10.1074/jbc.R000005200. PMID 10770957. ^ Futerman AH (December 2006). "Intracellular trafficking of sphingolipids: relationship to biosynthesis". Biochimica et Biophysica Acta. 1758 (12): 1885–92. doi:10.1016/j.bbamem.2006.08.004. PMID 16996025. ^ van Meer G, Lisman Q (July 2002). "Sphingolipid transport: rafts and translocators". The Journal of Biological Chemistry. 277 (29): 25855–8. doi:10.1074/jbc.R200010200. PMID 12011105. ^ Vesper H, Schmelz EM, Nikolova-Karakashian MN, Dillehay DL, Lynch DV, Merrill AH (July 1999). "Sphingolipids in food and the emerging importance of sphingolipids to nutrition". The Journal of Nutrition. 129 (7): 1239–50. PMID 10395583. ^ Chung N, Mao C, Heitman J, Hannun YA, Obeid LM (September 2001). "Phytosphingosine as a specific inhibitor of growth and nutrient import in Saccharomyces cerevisiae". The Journal of Biological Chemistry. 276 (38): 35614–21. doi:10.1074/jbc.m105653200. PMID 11468289. ^ Cowart LA, Obeid LM (March 2007). "Yeast sphingolipids: recent developments in understanding biosynthesis, regulation, and function". Biochimica et Biophysica Acta. 1771 (3): 421–31. doi:10.1016/j.bbalip.2006.08.005. PMC 1868558. PMID 16997623. ^ Brice SE, Alford CW, Cowart LA (March 2009). "Modulation of sphingolipid metabolism by the phosphatidylinositol-4-phosphate phosphatase Sac1p through regulation of phosphatidylinositol in Saccharomyces cerevisiae". The Journal of Biological Chemistry. 284 (12): 7588–96. doi:10.1074/jbc.M808325200. PMC 2658053. PMID 19139096. ^ Chen K, Ho TS, Lin G, Tan KL, Rasband MN, Bellen HJ (November 2016). "Loss of Frataxin activates the iron/sphingolipid/PDK1/Mef2 pathway in mammals". eLife. 5. doi:10.7554/eLife.20732. PMC 5130293. PMID 27901468. ^ Chen K, Lin G, Haelterman NA, Ho TS, Li T, Li Z, Duraine L, Graham BH, Jaiswal M, Yamamoto S, Rasband MN, Bellen HJ (June 2016). "Loss of Frataxin induces iron toxicity, sphingolipid synthesis, and Pdk1/Mef2 activation, leading to neurodegeneration". eLife. 5. doi:10.7554/eLife.16043. PMC 4956409. PMID 27343351. This page was last edited on 22 January 2019, at 21:41 (UTC).